When you walk pass XIXILI boutique in 1 Utama, Mid Valley or Queensbay Mall did you realize the special window display? Bra can be transformed into art pieces. Always wear your invisible crown was the captivating quote of XIXILI Bra Art visual experience at XIXLI boutique in 1 Utama Shopping Centre. The art piece featured at 1 Utama is just one of three artworks commissioned by XIXILI centering around the theme of women empowerment. On the same day also we has a sneak preview of XIXILI Spring / Summer Lingerie Collection 2014. In line with XIXILI’s brand philosophy of ‘Uplifting You Always’; XIXILI embarked on a special bra art collaboration with Ms Louise Low, a talented young Malaysian artist who has recently been conferred the title of Malaysia’s Top 10 Female Visual Artist. The artist ingeniously created a beautiful three-piece art visual experience using over a thousand XIXILI bras. Each artwork serves to bring about the message of women empowerment to inspire women of all ages and walks of life. XIXILI proudly presents the three bra art visual experiences at its boutiques located at 1 Utama Shopping Centre, Mid Valley Megamall and Queensbay Mall, Penang. For the masterpiece at XIXILI 1 Utama Shopping Centre boutique, the artist created an art piece of brassieres which she has interprets as ‘embracing each other’. Made with hundreds of gold and purple printed XIXILI bras supporting each other, the centerpiece encapsulates a woman’s silhouette clad in bra cups. ‘Always wear your invisible crown’, titles the art piece, strengthening the message on women empowerment. The quote in itself speaks to all its readers on the important notion of self-respect, dignity, pride, self-confidence and leadership. 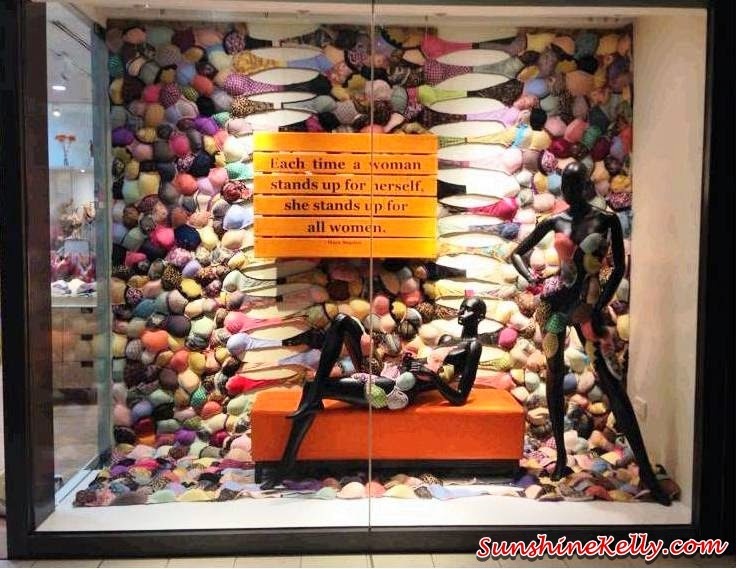 Similarly at XIXILI Mid Valley Megamall boutique, the bra art visual display centre around the theme of ‘togetherness’. Decked with waves of colourful bras, an inspirational quote “You! Yes, You! The one reading this. You are amazing and simply the best at being you!” speaks directly at passer-bys. At XIXILI’s Queensbay Mall boutique, the artistic impression is themed with the act of ‘holding hands’. The window piece displays strength in unity as bras hold tightly to each other as they are stretched across the length. The quote: “Each time a women stands for herself, she stands up for all women. – Maya Angelou” emblazons this piece. Louise Low launched the bra art visual display experience at XIXILI One Utama boutique. The sponsors for the launch include Arimino, Berrywell, Body Perfect, DIGI, Hijabista Magazine, Juiceworks, Kose and Pantai Premier Pathology Sdn Bhd.